4th Annual 5-Km and 1-Mile Road Race Under the Full Moon! For the fourth year in a row pleasant Chicago-conditions, slightly warm for road running, greeted eager runners in our neighborhood of Norwood Park. Volunteers began set up for our 4th annual Chicago Full Moon Run at the hour of 5:00 pm. Soon participants arrived and bustled through check-in, packet pickup, and over to our starting areas. As they moved to the starting area... last-minute instructions were provided to 5-Km featured event participants. At 7:29:18 pm Michelle blasted the air-horn, setting runners off, westbound along Hurlbut Street. Five minutes later, 132 meters farther west on Hurlbut Street, co-race director Michael Bastian sounded the air-horn again, this time sending 1-Mile Lunar Orbiters to the roads on their adventure at 7:35:11 pm. 1st Place Female: Claudia Badillo, 34 of Chicago - 7:36.4 * New female race record! Top Masters Male: Michael Martineau, 40 of Chicago - 17:17.0 * New masters race record! Many thanks to primary supporters of our 4th Annual Chicago Full Moon Run! Lieutenant John Garrido who arranged & provided us with extra race-day bike patrol! "Thank you" to the community of local businesses and families for their contributions of raffle prizes! 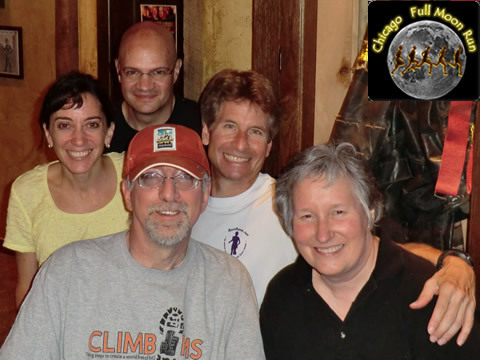 Runner check-in and packet pickup: Paul Hendrickson, Gayle Ryan, Ann Curran, Denise Poy, Ian Stevens, Janice, Ian Stevens. Start / Finish line set up/tear down: Mike Vlasak, Paul Hendrickson, Joe Bastian, Nathan Bastian, Bryan Cleal, Bob Thom, Jason Maurer, Tom Kohler, Mike Grabowski. Course centurions and traffic control: Stuart Gootnick, Ann Curran, Denise Poy, Melissa Savage, Pat Savage, Bob Thom, Daniel Donato, Ian Stevens, Paul Hendrickson, Kevin Listro. Photography: Frank Donato, Greg Roberts. Post-race party and raffle coordinators: Irene and Kevin Listro. Finally... thanks to all dedicated runners who came out, contributed generously to our cause of the battle against Multiple Sclerosis, and took on the challenge of racing under the glow of the supermoon in our 4th Annual Chicago Full Moon Run! Scroll down to see a gallery of photo images taken at our 4th Annual Chicago Full Moon Run. These photos (below) have been optimized for display on the internet... if you'd like a "high-resolution" original (suitable for printing) contact me and I will email you with the original digital image... be sure to specify which photo(s) you'd like. Congratulations to all who participated in our 4th Annual Chicago Full Moon Run. Please plan to attend our 2016 edition, which will fall on the date of Wednesday July 20th. Woo hoo... that's going to be right on the date of July's Full Moon!